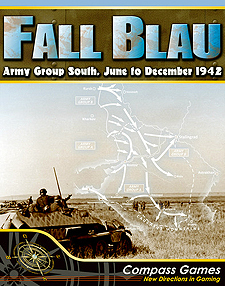 Fall Blau is a game simulating the 1942 campaigns of Army Group South to take the Caucasus and Stalingrad. The game uses a chit-pull system for determining strengths of certain units and provides a limited fog of war. This is a monster game with few rules, medium complexity and high solitaire suitability. The basic turn sequence is classic IGO-UGO which consists of movement and combat, with possible attacks for mechanized units during movement. Planes are simplified though the use of Air Points. Free and historical setup options are available and automatic victory goals based on Hitler's whim. There are nine scenarios in the game: six scenarios which use a portion of a single map and three major campaigns which use multiple maps.